SUMMARY: We report the case of a patient with an acute middle cerebral artery occlusion emergently revascularized with a Neuroform self-expanding stent. A 57-year-old right-handed woman presented to our emergency department 60 minutes after developing acute right-sided weakness and inability to speak. Her past medical history was significant for atrial fibrillation, for which she was taking warfarin. On examination, she was afebrile, her blood pressure was 160/90 mm Hg, and her heart rate was 60 beats per minute and irregular. She was lethargic, mute, and did not follow commands. Her pupils were equal and reactive, but she had a forced conjugate gaze deviation to the left, a right homonymous hemianopia, and attenuated right central facial weakness. Her right arm and leg were plegic, with decreased sensation to pain. Initial laboratory studies were normal except for an elevated international normalized ratio (INR) of 2.9. A noncontrast head CT performed at approximately 1 hour 45 minutes from stroke onset revealed subtle loss of the left insular ribbon and gray-white junction in the left temporal-parietal region, with no evidence of hemorrhage. A perfusion CT scan was attempted but was aborted because of excessive patient motion. Because IV rtPA was contraindicated in the setting of an elevated INR, the neurointerventional service was consulted for angiography and possible transarterial revascularization. After induction of general anesthesia, a 5F intravascular sheath was introduced into the right common femoral artery, and the left common carotid artery was catheterized with a 5F Envoy guide catheter (Cordis, Miami Lakes, Fla). Angiographic evaluation of the left common carotid bifurcation was unremarkable, though further examination of the intracranial left internal carotid artery (ICA) runoff was notable for occlusion of the proximal left M1 segment (Fig 1). Leptomeningeal collateral support of the “at-risk” middle cerebral artery (MCA) territory was poor, with slow, late retrograde filling of a few frontal MCA branches from distal branches of the left anterior cerebral artery. 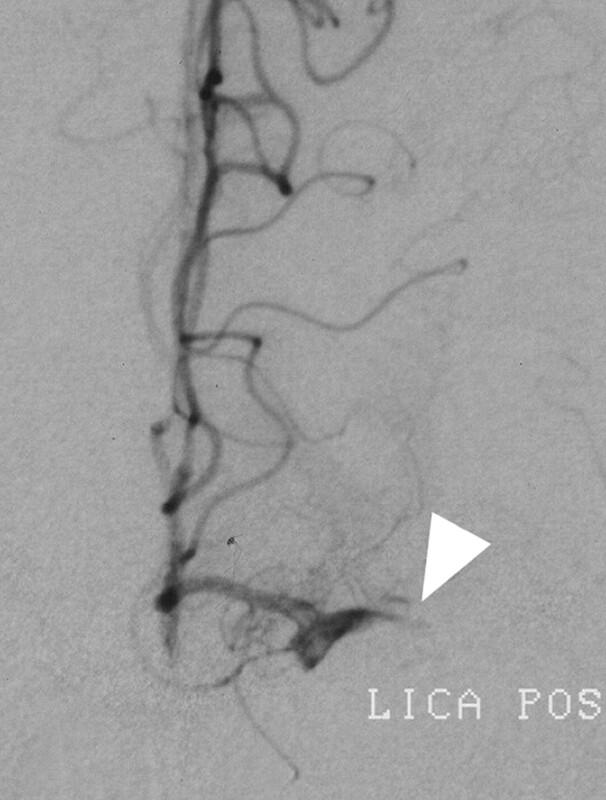 Sluggish retrograde filling of the left angular MCA branch from posterior cerebral artery leptomeningeal collaterals was demonstrated by left vertebral artery angiography. Initial left ICA angiogram, frontal projection, demonstrating occlusion of the proximal left M1 segment. Because the Merci clot retriever was not available at our institution, we first attempted to disrupt the occlusive thrombus with the glycoprotein IIa/IIIb inhibitor abciximab. Eight milligrams of abciximab were administered intravenously, and the left MCA was superselectively catheterized with an SL 10/18 microcatheter (Boston Scientific, Natick, Mass). The microcatheter was advanced over a 0.014-inch guidewire through the occlusive M1 segment lesion, and the superior and inferior MCA divisions angiographically demonstrated to be free of more distal emboli. The microcatheter was then withdrawn back into the 1-cm thrombosed segment, and an additional 12 mg of abciximab infused into the lesion for approximately 10 minutes with a pulse-spray technique. Angiography performed 20 minutes after abciximab administration demonstrated persistent M1 segment occlusion (Fig 2), so the microcatheter was again advanced beyond the occlusion and exchanged over a 300-cm 0.014 X-Celerator microguidewire (Micro Therapeutics, Irvine, Calif) for a 4 × 20 mm Neuroform stent delivery microcatheter (Boston Scientific). The stent was deployed uneventfully into the M1 segment, immediately restoring antegrade flow, approximately 4 hours after the onset of symptoms (Fig 3). No procedural complications were experienced. Serial postprocedural head CT examinations revealed immediate contrast enhancement of the left basal ganglia, insula, and frontal operculum, which cleared during the subsequent 8 hours without evidence of parenchymal hemorrhage. Left ICA angiogram (performed through indwelling microcatheter), frontal projection, following administration of abciximab demonstrating persistent occlusion of the left M1 segment (arrowhead). 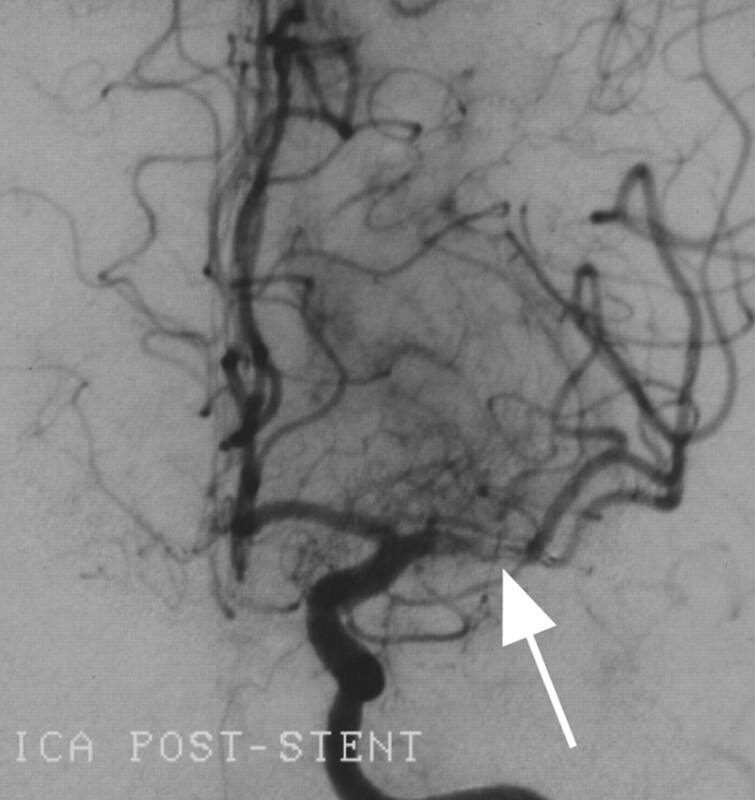 Left ICA angiogram, frontal projection, demonstrating revascularization of the left M1 segment following placement of a 4 × 20 mm Neuroform stent. Note the filling defect in the M1 segment representing residual debris trapped beneath the stent struts (arrow). The patient was transferred to the neurosurgical intensive care unit and was started on clopidogrel 75 mg/day the morning after the procedure to prevent subacute stent thrombosis. Intravenous (IV) heparin was started for atrial fibrillation once her INR fell to <2.0. Her systolic blood pressure was maintained at <150 mm Hg with IV labetalol infusion for the first 72 hours to prevent reperfusion hemorrhage. Six weeks poststroke, she was awake and alert, following commands briskly, and verbalizing comprehensible words. Her gaze deviation had resolved, and she could briskly elevate the right leg off the bed for several seconds. Follow-up head CT revealed restricted areas of infarction involving the left lateral temporal and parietal lobes and left frontal operculum, with notable sparing of the supramarginal gyrus, deep structures, and superior frontal cortex. Our patient illustrates several common clinical dilemmas encountered in acute stroke care. Although presenting within an appropriate time window to receive thrombolytic therapy, her current use of warfarin with an INR of 2.9 was an absolute contraindication to rtPA treatment. The list of contraindications for thrombolytic therapy in acute stroke is extensive and largely explains why <3% of stroke patients nationwide are treated with IV rtPA.1 Common contraindications to IV rtPA include time from onset >3 hours, blood pressure >185/110 mm Hg, history of intracerebral or subarachnoid hemorrhage, recent stroke or head trauma, recent gastrointestinal or genitourinary hemorrhage, recent major surgery, recent lumbar puncture, post–myocardial infarction pericarditis or ventricular aneurysm, bacterial endocarditis, and pregnancy.4 Intra-arterial (IA) administration of thrombolytic agents may extend the therapeutic window ≤6 hours from symptom onset but is still constrained by most of the remaining contraindications, including therapeutic anticoagulation. Even if our patient had no contraindications to thrombolysis, the efficacy of IV rtPA for revascularizing large-artery occlusions is limited. The recanalization rate with IV rtPA is only 25% for MCA (M1) occlusions and 10% for ICA occlusions.5 Direct IA delivery of thrombolytic agents to the site of occlusion appears to improve the likelihood of successful recanalization. The recanalization rate for M1 occlusions was 66% for IA pro-urokinase in PROACT-II,6 and 70% for the combination of IV and IA rtPA in the EMS study7; however, despite the improved recanalization rates with IA and combined (“bridging”) thrombolytic regimens, a significant proportion of M1 occlusions remain completely refractory to thrombolytic-driven recanalization. Mechanical thrombectomy has been advocated for patients with contraindications to thrombolysis, or with occlusive lesions refractory to thrombolytic therapy, but reported recanalization rates (54% for the Merci retriever in the phase II study3) have not been superior to those obtained with IA thrombolysis, which suggests that a large proportion of occlusive lesions are refractory to available methods of mechanical thrombectomy as well. Considering the extensive list of contraindications and incomplete effectiveness of currently accepted therapies (thrombolysis and thrombectomy), the need to discover new methods of urgent revascularization for effective acute stroke management is apparent. In our patient, we successfully deployed a self-expanding Neuroform stent through an M1 segment occlusion and immediately restored antegrade blood flow into the MCA territory. The effectiveness of using a Neuroform stent for urgent revascularization in the setting of acute ischemic stroke, relative to the Merci retriever or thrombolysis, is not known, but the ease with which it was deployed and the immediacy of its effect in this case warrants further investigation. The time required to achieve recanalization once an intervention is initiated has been largely unaddressed in previously published reports and may be a critical factor influencing patients’ functional outcomes in this setting where the duration of ischemia is necessarily linked to the extent of infarction. Although balloon-expandable stents have been used widely to treat acute coronary artery occlusions, this strategy has not been adopted as a front-line treatment of thromboembolic stroke. In part this can be attributed to difficulties in negotiating the cerebral vasculature with the heretofore available balloon-expandable stainless steel stents. Moreover, with acute cerebral artery occlusion, the diameter and anatomic disposition of the occluded artery is frequently not visualized, introducing a degree of uncertainty in selection of stent size and judging the extent of balloon inflation required for proper stent deployment. In this regard, for acute revascularization of thromboembolic cerebral artery occlusions, self-expanding stents, such as Neuroform, may have several advantages over angioplasty balloon-expandable stents. Self-expanding stents have the capacity to accommodate variable vascular diameters while remaining uniformly apposed to the vessel wall. Conversely, balloon-expandable stents require inflation of the balloon to a nominal pressure for stent deployment to a predetermined diameter and need to be sized with consideration to the narrowest vascular diameter within an anatomic segment, complicating their use in situations where vessel diameter varies significantly within the stented segment, such as at bifurcation points. If overexpanded to match the largest vessel diameter, there is a risk of rupturing the narrow segment of the vessel. If deployment expansion is limited to the narrower vessel diameter, the portion of stent in the larger vessel segment may remain asymmetrically malapposed to the vessel wall or completely unimbedded, requiring postdeployment reangioplasty, and potentially leading to subsequent stent thrombosis. Although Neuroform was designed for lower expansion forces, as with other nitinol self-expanding stents, the outward remodeling force can be adjusted upward by “oversizing” the stent for a given vessel. The self-expanding characteristics of Neuroform also permit accommodation to an increasing effective vessel diameter, which may occur over time as the thrombotic debris trapped beneath the stent is subsequently resorbed. Deployment of a Neuroform self-expanding stent through a persistent M1 segment occlusion in the setting of acute stroke resulted in rapid revascularization of the MCA territory with no complications and likely resulted in reduced infarct size and improved functional outcome. 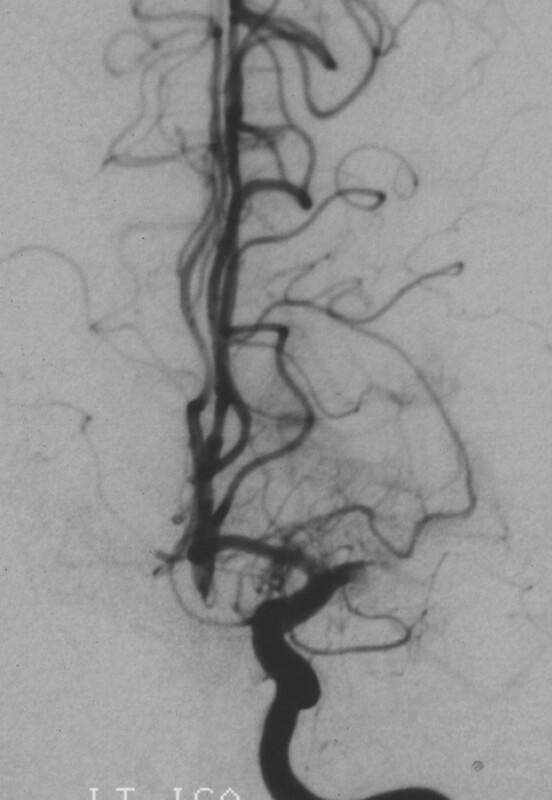 As the treatment for ischemic stroke is pushed beyond the 3-hour therapeutic window to include more patients, particularly those with contraindications to thrombolysis, the role of the neurointerventionalist in acute stroke will continue to expand and, one hopes, encourage the continuing development of novel, more efficacious, and safe endovascular treatments. Albers GW, Amarenco P, Easton JD, et al. Antithrombotic and thrombolytic therapy for ischemic stroke: the Seventh ACCP Conference on Antithrombotic and Thrombolytic Therapy. Chest 2004;126(3 suppl):483S–512S.